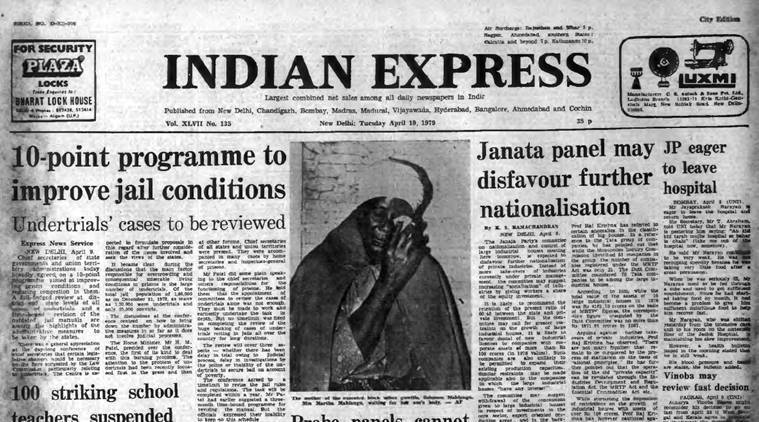 The Indian Express, April 10, 1979, forty years ago. The Janata Party’s committee on nationalisation and control of large industrial houses meeting in Delhi tomorrow is expected to disfavour further nationalisation. Instead of more takeovers of industries currently under private management, the committee may suggest increasing “socialisation” of industries by giving workers a share of the equity investment. It is likely to recommend the retention of the present ratio of 60:40 between the state and private investment. But the committee may call for greater restraints on the growth of large industrial houses. It is likely to favour denial of new industrial licences to companies with corporate assets of more than Rs 100 crore. Such companies are also unlikely to be permitted to expand their existing production capacities. Nanaji Deshmukh, general secretary of the Janata Party, and nine prominent leaders of the Jana Sangh group, said that the question of Jana Sangh members’ dual membership — with the Janata and RSS — was no longer an issue. Addressing a news conference, Deshmukh pointed out that it was only some individuals who were consistently campaigning against the RSS. “The controversy was started by some individuals and I would not like to blame either the BLD group or the socialists for this,” he said. The question of dual membership, Deshmukh said, had figured at the group of 24 meeting as well as the recent National Executive and Parliamentary Board meetings of the party. Chief secretaries of states and union territories broadly agreed on a 10-point programme aimed at improving prison conditions and reducing congestion. A full-fledged review at district and state levels of the condition of all undertrials and a time-bound revision of the outdated jail manuals are among the highlights of the administrative measures to be taken by the states.